Why doesn't Nokia Catalogs add FlashLite contents ? Nokia Catalogs is a simple but useful software that allows mobile users to buy contents from operator and 3rd party portals. I totally agree with Tommy when he said that he still prefers to browse the applications from the web and then choose if install it on the phone. I'd love to see some 3rd party FlashLite contents in this Nokia official application ! During these holidays I spent some time using Adobe After Effects for creating and editing some videos to use in a flash application. I was surprised by the SWF Export option esposed by After Effects and how it works well with my videos. I followed these useful series of articles and tips and I found out the new Adobe Motion Design Center where I read a lot of tutorials. It's a must read ! Great job Adobe ! In these days we have been exchanging ideas with some FlashLite gurus about using WURFL to capture Flashlite-related capabilities. This project is open-source and is intended for developers working with the WAP and Wireless. Stay tuned for the progress about WURFL and FlashLite ! FlashLite 2 on Adobe Store for 10USD : it's now public. Adobe are releasing the Flash Lite Player 2 “early” to enable developers and enthusiasts to begin playing with Flash Lite 2 over the holidays, said Bill. You can purchase an IMEI locked version of the player through the Adobe online store for $10 USD for the following supported Nokia handsets: 3230, 6260, 6620, 6630, 6670, 6680, 6681, 6682, 7610, N70, and N90. 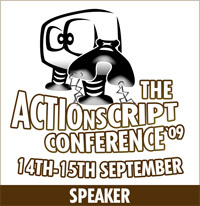 I can't wait to see Flashlite 2 features like support for ActionScript 2.0, Video playback, external XML parsing and Local, persistent data on the device. NTT DoCoMo and Plastic Logic are developing some experiments in mobile device displays that are interesting steps toward the future. Will we see a new generation of interactive FlashLite contents on DoCoMo handsets ?? thin, flexible, and ultra-light user interface may ultimately change handset design. This is the second public Working Draft of the Mobile Web Best Practices 1.0 released by W3C. The Mobile Web Best Practices specifies best practices for Web content when accessed from mobile devices. The primary goal is to improve the user experience of the Web when accessed from such devices. Can't wait anymore to see one of these great browsers with the Flash Lite embedded as plug in ! Googling for jpg to swf converter I found some PHP-wrappers that dynamically load images into your FlashLite contents and convert JPEG on the server side to SWF. All of the softwares listed are for free. I do not try them yet, but I'll do it soon ! 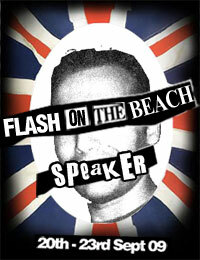 If you want to see the command in action you can read the FlashLite 1.1 Language Reference on Livedocs site. To have a list of installed applications on my mobile phone it's enough to see under Menu > Tools > Manager . These days I'll post more resources on this interesting topic ! I just wanted to thank James Talbot and Bill Perry for giving me the possibility to attend the Flash Lite test class last week in San Francisco. I can't wait to become Master Instructor in FlashLite and start the Macromedia Official FlashLite for Mobile Application Development course. Bill Perry and Johnatan Duran show us a lot of FlashLite enabled devices and answer our questions ! I saw some cool japanese (DoCoMo and KDDI) devices with their menu interfaces developed in Flash ! Wow !! We had great time ! 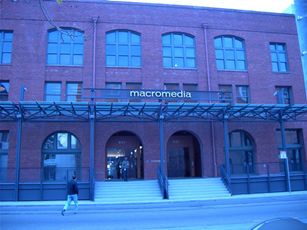 This is the main entrance to the Macromedia Office in TownSend street, San Francisco.